Ok I admit it, when it comes to gift ideas for tween girls I’m at a loss. But my daughter, who is a tween herself, has a ton of great gift ideas for tween girls to share with us. I asked her to come up with some of her best gift ideas for tween girls and these are the ones that made the cut. Here is my daughter Ave to share her best gift ideas for tween girls. Hi, I’m Ave, my dad tried to do this post but… it was terrible. So instead of giving you things that parents THINK you want, I went and asked my friends what they ACTUALLY want. We are all tweens, so you can rest assured that these gifts are legit. I love my phone, and I love to accessorize it. This is the case I’m looking at right now but there are tons of things you can get. My brother and I go through headphones very quickly so getting some extra headphones is on the top of my list. Check these ones out! I love my pop socket. Now whenever we go to the store I look for other ones. I have a pineapple pop socket that we got in Maui but I also like a few other ones. Depending on your daughter there are likely a pop socket that suits her style. I love these plushy cell phone holders. They are super cute. and I’ll stop losing my iPod if I have a place to put it. They come in lots of colors and you can find them for a really good price. OMG! I just am in love with charm bracelets right now!!! I feel it is fun to collect charms or, you could buy one with charms attached!!! I have seen a couple different kinds!!! Some have food on them or eiffel towers or pretty charms! There are many ways you can express yourself with charm bracelets!! Get one of them here. My friends and I are into making things right now. Every body has these kits and I really want one too. If you can get it under $20 you are doing good. Check out the current price here. I love this make up case, I cab put everything I want in it and it comes in 3 cute colors. It will fit perfectly on my desk, hint hint dad. I love, love, love this mail polish and purse set, You can use it to do nail art, give manicures. It’s the perfect thing for sleepovers with your friends. See all it comes with here. I have allergies so I need to carry an Epipen, but they aren’t exactly easy to put in your pocket. So I use want this sequin backpack. It’s super cute! There’s only a few left so you might want to get it sooner than later. Hint Hint Dad. It’s purple (or 15 other colors if you want) and it goes on your back pack or purse. Super cute for anyone wanting to accessorize their bag. Check it out here. I like to play games with my friends right now these are the BIG games we love to play. This is a pretty new game, but it’s the game all of my friends want right now. I’ve played it at my neighbours and it’s a lot of fun. You can see the details here. It’s an old game but you can get it for under $20 at most places, this is great one if you need to get a birthday gift for someone. There are so many different types of Clue games now that you can find one for your bestie. Check them out here. I really like this Harry Potter version of Clue. Its flavored jelly beans in a game, you take one try it and it’s either something really good or really bad. We love playing this! You can get it here. My brother loves this game. I think it’s just that he likes the whipping cream you use. It’s a fun game to play. Everyone in my class is asking for Pie Face this year. I want this mermaid tail so badly!!! They look so comfy and warm. It’s going to be the perfect thing for winter. They come in a bunch of colors, in case blue isn’t your thing. I love the way a canopy bed looks this one looks like it would be perfect for my room. I could hide out and read my book, you can get it here! I love collecting pillows. Everywhere I go I want to add another one to my collection. Here are a few of my favourites. The unicorn pillow comes in about 20 different styles besides unicorn, so make sure you look at all of them. See all the different types of throw pillows here. I love being able to write. Whether it’s doodling or teaching my younger brother something. There are so many things I could do with this little LCD writing tablet. See everything they can do. It saves 100,000 of paper so it’s good for the trees! Speaking about writing, This journal is called “Wreck this Journal” and it’s a best seller on amazon. The idea is to write in in and they give you ideas and things to do. It’s so cool I’m thinking I might get this for my friends for their birthdays. Find out about all the cool things this journal does here. I love coming home from school and getting into a onesie. They are so comfy and warm. There are about 100 onesies that I want so I’ll let you take a look and see what ones work best for your daughter. There are two slippers I really want. The first on is these cartoon emoji poop slippers. They are warm and cozy, and hilarious. You can see them here! The other ones are these smiley face slippers. They come in different faces (laughing, loving, crazy) so there are a few to choose from and they are under $15 so it’s not too expensive. or If you want something really cool there is these Unicorn light up slippers. I love curling up with blanket when we watch Tv or play a game as a family. When I sprained my knee I needed this pillow, now I love it so much I can’t go without it. My friends and I are OBSESSED with these. There’s so many different ones I want to get them all. Here is the one I’m looking at right now. As you can tell from the Cat hoodie, I’m obsessed with Kitty ears lately. Maybe it’s because my dad has an allergy to cats so we can’t have one. This is a 9 pair set of earrings and there are some really cute ones. They are hypoallergenic, my dad says that means they are allergy free, so that is good when you have allergies. My bestie and I share one of these, it’s really fun! You got it right here of course! I love this cute beanie (we call them toques but that’s a whole other thing) it looks so comfy and cozy! If pink isn’t your thing it comes in black, white and grey too. Check them out here. I love learning to bake, this is the kit I want to get more into it. 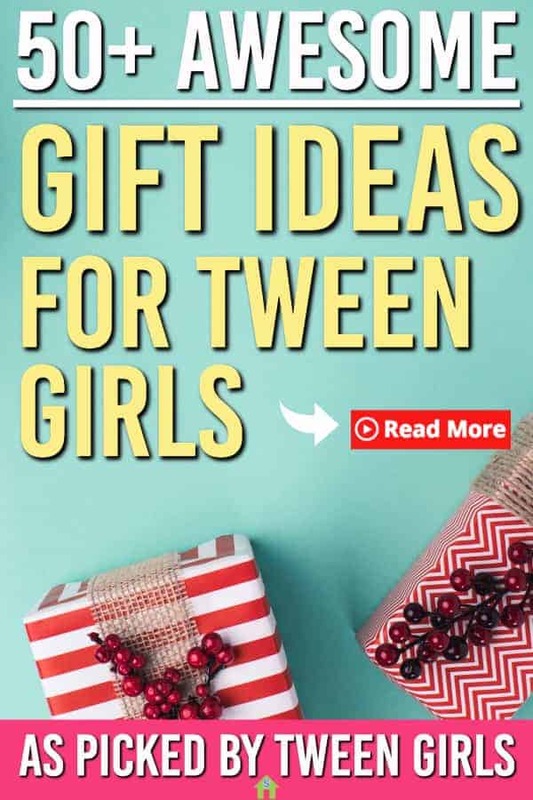 All of these are great gift ideas for tween girls. I hope you really enjoyed this list, I had a lot of fun making it. Sorry I didn’t write down some things but it’s a really long list. Like what you saw? Share it so others can get some ideas for their tween girls!